I was a nervous wreck as we took our precious baby in for his hearing testing. It knew both the doctor and the audiologist through my nursing job, but today they were strangers to me. Strangers that would confirm my worst fear and change my life forever as they introduced me to the world of deafness. After the otolaryngologist reviewed Jake's history and examined his ears, we were led into a soundproof booth. The first part of the testing was what they called a "soft sounds test" which included using low pitch noisemakers like baby rattles, jingling bells, ruffling paper and squeeze toy sounds within a one to two foot area behind him. The only response I saw from him was when the bells jingled about one foot from his ears. The next test, I was instructed to sit in a chair with Jake in my lap. My husband sat on the floor in front of us. He was holding a book so that Jake would look to it and not through the window to the audiologist in the other room. Our part was to keep him interested and focused on the book and hope that he looked up when he heard a sound. The audiologist presented some warbled sounds and speech sounds. They got louder and louder and louder but Jake didn't look up. I had just started to cry when Jake looked up innocently from the book and sat completely still. We got his attention again and he started to respond to the sounds at that level. He never looked for the sounds, his reaction was to look up and sit completely still. These responses were in the 55-60dB range or a moderate/severe range. Even though I knew it already, hearing the words from a qualified professional was quite a shock. I was devastated that all the singing, reading and talking that I had done for twelve months had not been heard. The next step was a scheduling a test called an ABR. Jake was sick the day of the appointment so we had to cancel the procedure. 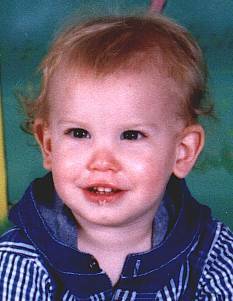 On February 13th, 1995, Jake was sedated with Chloral Hydrate for his first ABR. It was a terrible experience for us all because it took many attempts to get the medication into his little mouth without him throwing up and/or spitting it out. We had no idea how hard it would be to sedate such a little fellow! He finally passed out and was placed on an exam table to start the testing. All the little electrodes were attached to his head reminding me of something from a Frankenstein movie. As I watched the machine print out a graph, I wondered why it didn't have waves. All of my nursing books had said that the graph was supposed to show waves that represented the brainstems response to the stimulus. These were pretty much flat lines on this graph. SO where are the waves? The interpretation of the ABR read "ABR shows a total lack of evoked response up to 103dB, the maximum output of the equipment". The audiologist and otolaryngologist were somewhat puzzled by the results they had in front of them because were not consistent with the hearing range he obtained in the booth. He decided to do an ABR to 500 Hertz toneburst's. To confuse everyone even more, the toneburst results seemed to be consistent with the audiogram at 55-60dB. View the test results including Click and Toneburst ABR testing at initial diagnosis of hearing here. I never saw these results until the Spring of 2001. At that time, I found out that they were NOT consistent with the original audiogram! The tracings are made up of large cochlear microphonics and artifacts, not brainstem response. So, after learning that the toneburst ABR tracings were misread, we finally knew the answer to a piece of the confusing puzzle of Jake's hearing loss. Most of the visit after that is a blur to me. I do recall being told about signing and referred to a program called Child Find. We were given a demonstration of how a "typical deaf child" sounds when speaking, with the nasal quality. We were also told that Jake would probably need hearing aids. We were told how difficult it would be for us to get health insurance that would cover Jake; in the event we ever had to change coverage, because he now had a pre-existing condition. I can't honestly say that I felt it was an appropriate part of counseling parents when you just delivered the news that their child is hearing impaired. And I can't say that I even cared about insurance at that point in time. As we left the office that day, Jake was out cold from all the Chloral Hydrate. Mom was in a state of shock wishing she could just wake up from the nightmare she was trapped in. Dad was trying to hold it all together and be strong for us, but it was obvious he was hurting too. When the nurse looked at us and asked if we were okay, I started crying hysterically. I was holding my Jake so tightly I'm sure he could hardly breathe. When I called my parents, I was crying like a lost child and could barely speak. The next morning we received a call from the audiologist stating that he didn't feel comfortable fitting Jake with hearing aids. He hadn't fit hearing aids on a child in a long time and the test results were odd so he would like to refer us to his former professor at LSU, Charles I. Berlin, Ph.D., the Director of the Kresge Hearing Research Lab in New Orleans. We agreed and the audiologist scheduled an appointment for Jake to see Dr. Berlin the next day.